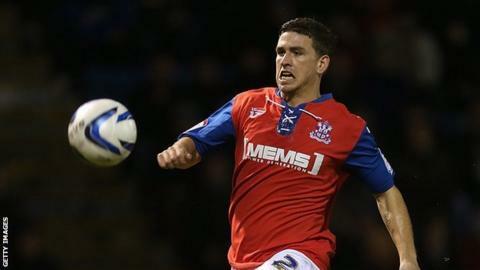 Cody McDonald's 50th Gillingham goal condemned high-flying Peterborough to their first away defeat of the season. The striker gave the Gills the lead by heading home Jake Hessenthaler's cross. A fluke goal from Jon Taylor levelled the game on the stroke of half-time, when a cross-turned-shot looped in over on-loan Gills keeper Stephen Bywater. Joe Newell hit a post for the visitors, but McDonald won it by converting from the penalty spot four minutes from time after Christian Burgess handled. Gillingham move to within two points of the play-off places, while Peterborough still lie second but are now four points behind leaders Bristol City. Match ends, Gillingham 2, Peterborough United 1. Second Half ends, Gillingham 2, Peterborough United 1. Joe Martin (Gillingham) wins a free kick in the attacking half. Attempt missed. Christian Burgess (Peterborough United) header from the centre of the box misses to the left. Kane Ferdinand (Peterborough United) wins a free kick on the right wing. Goal! Gillingham 2, Peterborough United 1. Cody McDonald (Gillingham) converts the penalty with a right footed shot to the top right corner. Penalty conceded by Christian Burgess (Peterborough United) with a hand ball in the penalty area. Joe Martin (Gillingham) wins a free kick in the defensive half. Attempt missed. Jack Payne (Peterborough United) right footed shot from the centre of the box is just a bit too high. Substitution, Gillingham. Brennan Dickenson replaces Luke Norris. Foul by Josh Pritchard (Gillingham). Substitution, Peterborough United. Conor Washington replaces Luke James. Attempt missed. Bradley Dack (Gillingham) right footed shot from outside the box is just a bit too high from a direct free kick. Amine Linganzi (Gillingham) wins a free kick in the attacking half. Michael Smith (Peterborough United) is shown the yellow card. Substitution, Gillingham. Josh Pritchard replaces Doug Loft. Substitution, Peterborough United. Kane Ferdinand replaces Jon Taylor because of an injury. Jake Hessenthaler (Gillingham) is shown the yellow card. Attempt missed. Doug Loft (Gillingham) right footed shot from outside the box misses to the right. Corner, Gillingham. Conceded by Christian Burgess. Attempt missed. Kyle Vassell (Peterborough United) right footed shot from outside the box misses to the right. Jack Baldwin (Peterborough United) hits the left post with a left footed shot from outside the box. Corner, Peterborough United. Conceded by Aaron Morris. Attempt blocked. Jack Payne (Peterborough United) left footed shot from outside the box is blocked. Attempt missed. Christian Burgess (Peterborough United) header from the left side of the six yard box misses to the left.